JOHN J. COLANTUONE, BARBARA E. COLANTUONE and HARRY COLLETTA v. BRIAN J. McDONALD, JOHN F. CAREY, JOHN F. YOUNGCLAUSE, PEG GOUDY and FRANCIS E. MURPHY as they are the special permit granting authority of the Town of Weymouth. This case involves a G.L. c. 40A, § 17 appeal of a special permit application. The applicants had applied to the Selectmen for the Town of Weymouth, who were sitting as the Zoning Board of Appeals, to operate a quick change oil, lube and tune-up service. After a hearing, the Selectmen denied the application, whereupon the plaintiffs appealed to the Land Court. Upon the request of all counsel, this Court remanded the case to the Selectmen, they again denied the application, and the case proceeded to trial. 1/ The plaintiffs John N. Colantuone and Barbara E. Colantuone (the "Colantuones") reside at 46 Priscilla Drive, Pembroke, Massachusetts and are the buyers under a Purchase and Sale Agreement for the locus which is located at 412 Washington Street, Route 53, near the intersection of Routes 53 & 18, Weymouth, Massachusetts (the "locus"). 2/ The plaintiff Harry Colletta resides at 120 Point Street, Providence, Rhode Island, and is the owner of the locus. 3/ The defendants Brian J. McDonald, John F. Carey, John F. Youngclause, Peg Goudy and Francis E.Murphy are all members of the Board of Selectmen, who act as the special permit granting authority of the Town of Weymouth (the "Selectmen"). 4/ The Colantuones entered into a Purchase and Sale Agreement with Harry Colletta to purchase the locus. The Colantuones contemplated purchasing the locus to be used as a "speedee oil change and tune up facility" (the "Speedee facility") The locus consists of approximately 24,400 square feet of vacant land which has not been used for any purpose for many years. 5/ The Speedee facility provides a convenient and quick oil change, lubrication and tune-up service without need of a prior appointment. 6/ The proposed structure for the Speedee facility consists of a one story structure containing approximately 2,300 Square feet. The building would contain two lubrication bays which could service four cars at one time, and one tune-up bay which could service two cars at a time. The building would have garage doors on the front and rear to allow cars to drive through the facility in one direction. 7/ The Speedee facility would operate between the hours of 8:00 A.M. and 6:00 P.M. Monday through Saturday. 8/ The Speedee facility would not sell any gasoline products on the locus, nor does it incorporate or use any hydraulic lifts. 9/ The Speedee facility would use 9 employees to servce the cars. 10/ The average time for an oil change at the Speedee facility would be 9 minutes, and the average time for a tune-up would be 30 minutes. 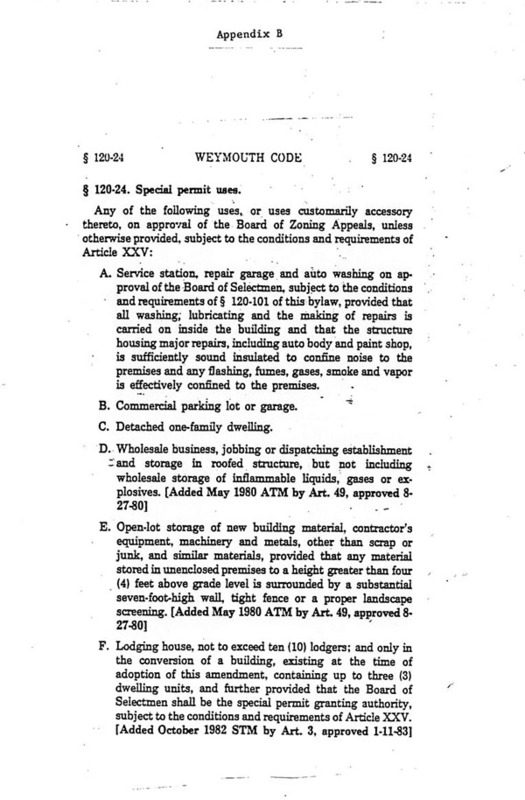 11/ On August 31, 1987, the Colantuones filed an application for a special permit to operate the Speedee facility with the Selectmen (the "application"). 12/ On September 28, 1987, the Selectmen held the first of four parts of a public hearing to discuss the application. At that time, the Selectmen voted to continue the hearing until the next scheduled meeting for further consideration of the effect of the facility on traffic and in order for the Colantuones to prepare and present a revised traffic report. (the revised traffic report). The study was revised to analyze what traffic conditions would be if other proposed area developments became operational after the Speedee facility became operational. The other proposed area developments consisted of a shopping center at the intersection of Routes 53 & 18 and eleven other unspecified projects in the immediate area. 13/ The revised traffic report provided, and I so find, that Route 53,	at the time of the hearing on the Colantuones' application and at the time of trial, was running at close to capacity during its peak hours of use. Specifically, during the midday Saturday peak hours the road was classified as a level of service "E". This classification is derived from the Transportation Research Board; Special Report 209, Highway Capacity Manual; Washington, D.C.; 1985. A level of service E indicates that the road is operating with very long traffic delays. The next lower level of service is "F", which indicates that the road has no reserve capacity and that there are extreme delays in the use of the road. 14/ While the Speedee facility itself would have little noticeable impact on the traffic on Route 53, there would be some additional traffic created by the facility. 15/ If the Speedee facility were to begin operations along with the other planned area developments, the level of service on the Saturday peak hours would reach level "F". The Board found that the application should be denied because the site is not an appropriate location for the proposed use and will be detrimental to the established or future character of the town. The Board also found that there will be nuisance and possible serious hazard generated by the traffic from this use and in general the public convenience and welfare will not be substantially served. The conditions for a Special Permit have not been met. 17/ The locus is located in the B-1 business district as set out in the Weymouth Zoning By-Law (the "by-law"). 18/ The proposed Speedee facility would comply with the dimensional requirements for the B-1 business district. 19/ The immediate area surrounding the locus is highly developed, consisting predomnately of business uses. At the time the Court took a view of the locus, other businesses on Route 53 in the immediate area consisted of the following: a Citgo service station, an auto parts store, a gift shop, a marina, a lamp shop, a restaurant, an office building, a Midas Muffler shop, a Meinekee Muffler shop, a furniture store, a lobster shack, a Burger King restaurant, the Capeway restaurant, a Friendly's restaurant, a Mister Donut, a pizza shop, another office complex, a Pontiac car dealership, and a Computune service shop. 20/ While there is little undeveloped land abutting Route 53 in the immediate area surrounding the locus, there still remains approximately 200 acres of undeveloped land in the areas zoned for business use on Routes 53 & 18 which could conceivably be developed for business use. This undeveloped land represents approximately 50 % of the land in the business districts of Weymouth. 21/ Beginning in February of 1989, there was a fifteen month building moratorium in the B-1 business district. The Colantuones argue that the Selectmen exceeded their authority in denying their application to operate the Speedee facility, and therefore, that the decision denying said application should be annulled and the case remanded to the Selectmen with an Order that the permit be issued, subject to the imposition of reasonable conditions by the Selectmen. The Colantuones assert two arguments as to why the Selectmen exceeded their authority. The two arguments are based on two different constructions of the by­law. Under their first construction of the bylaw, they argue that the Selectmen have no discretion to deny their application to operate the Speedee facility, and therefore, that as a matter of law, they are entitled to a special permit. Under their second construction of the by-law, they argue that, despite the fact that the Selectmen may have authority to deny their application, that the Selectmen erred in refusing to grant the permit. The Colantuones' first argument presents a problem of statutory construction. The location of the Speedee facility is in the B-1 business district in the Town of Weymouth. The parties agree, and I so rule, that the use contemplated by the Speedee facility falls under § 120-24 (A) of Article VII of the by-law. [Note 1] The parties, however, disagree as to how that section of the by- law should be construed. A. 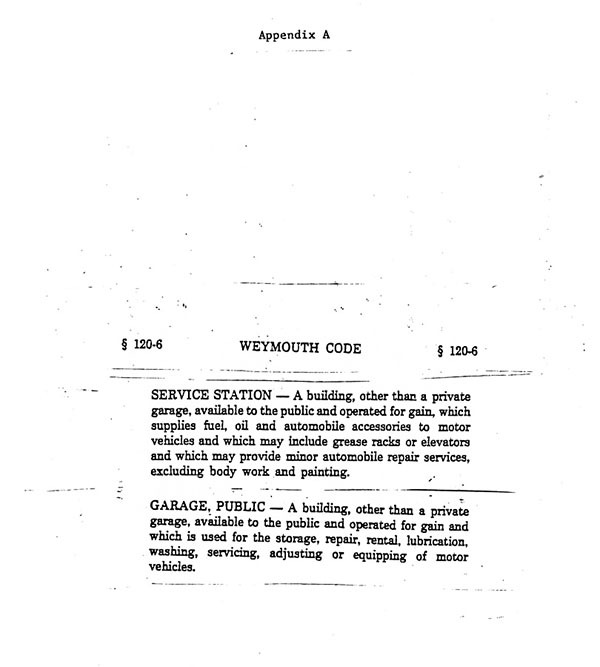 Service station, repair garage and auto washing on approval of the Board of Selectmen, subject to the conditions and requirements of § 120-101 of the by-law, provided that all washing, lubricating and the making of repairs is carried on inside the building and that the structure housing major repairs, including auto body and paint shop, is sufficiently sound insulated to confine noises to the premises and flashing, fumes, gases, smoke and vapor is effectively confined to the premises. . . . The Colantuones argue that the way the by-law is drafted, that what has been labeled a special permit under § 120-24 (A) , is in fact more analogous to a site plan review stuation, and therefore, that the Selectmen do not have any discretion under § 120-24(A) to deny an application for a special permit if the requirements specifically set out therein are met. See Prudential Insurance Co. of America v. Board of Appeals of Westwood, 23 Mass. App. Ct. 278 (1986) (where contemplated use may be conducted as of right, board did not have discretion to deny application for site plan review). 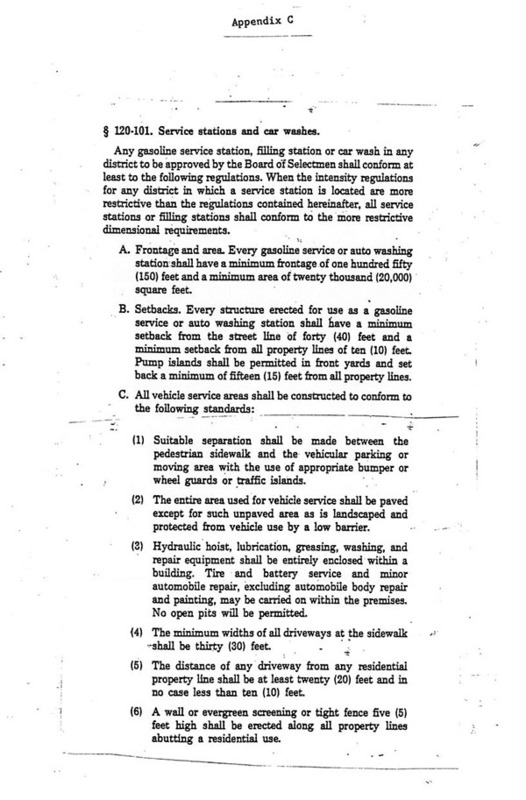 The Colantuones' construction of the by-law is based in large part on their assertion that the first sentence of § 120-24 excludes the standards for the grant of a special permit set forth in Article XXV from consideration when the Selectmen are the designated special permit granting authority. They argue that this construction of § 120-24 (A) is supported by the fact that Article XXV does not explicitly set out any standards for the Selectmen to apply in considering special permit applications. I reject this argument for the following reasons. The first sentence of § 120-24 provides that "Any of the following uses, or uses customarily accessory thereto, on approval of the Board of Zoning Appeals, unless otherwise provided, subject to the conditions and requirement of article XXV". The Colantuones argue that the eclusionary clause, "unless otherwise provided", modifies both the last antecedent to that clause as well as the clause subsequent to it in that sentence. This construction of that sentence is contra to general rules of both statutory and grammatical construction. It is a general rule of construction that a clause is construed to modify only the last antecedent. Baldiga v. Board of Appeals of Uxbridge, 395 Mass. 829 , 833 (1985). In examining § 120-24, I find nothing in the subject matter or dominant purpose of that provision which necessitates departure from the general rule. I therefore construe the sentence at issue as requiring the designated special permit granting authority to apply the conditions and requirements of Article XXV. This ruling, however, does not completely answer the question of whether or not the Selectmen have discretion to grant or deny the Colantuones' application. The primary task of a court in construing a local zoning regulation is to determine the intent of the legislative body which enacted the regulation in question. Board of Appeals of Hanover v. Housing Appeals Committee, 363 Mass. 339 (1973). In examining the framework of the by-law in conjunction with G.L. 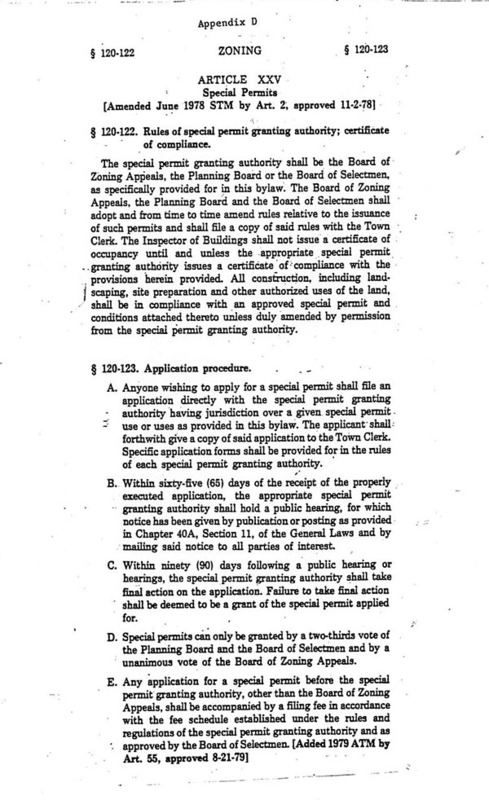 c. 40A, it seems clear that the intent behind the adoption of § 120-24 (A) was to give the Selectmen special permit granting authority over the uses specified in that section. Zoning ordinances or by-laws shall provide for specific types of uses which shall only be permitted in specified districts upon the issuance of a special permit. Special permits may be issued only for uses which are in harmony with the general purpose and intent of the ordinance or by-law. . . . This provision of the General Laws has been construed as allowing a municipality to confer discretionary power on a permit granting authority to grant or deny requests to conduct certain specified uses. See MacGibbon v. Board of Appeals of Duxbury, 356 Mass. 635 (1970); Prudential Insurance Co. of America v. Board of Appeals of Westwood, 23 Mass. App. Ct. 278 (1986). Article ,VII, in accordance with c. 40A, sets forth "permitted uses" and "special permit uses" in the B-1 business district. Under § 120-24 (A), the Selectmen are designated the special permit granting authority for the use contemplated by the Colantuones' application. The first paragraph of § 120-24 provides that the issuance of a special permit is subject to the conditions and requirements of Article XXV, and Article XXV provides that the Selectmen shall be one of the special permit granting authorities. The by-law, therefore, clearly sets forth that the Colantuones' contemplated use is allowable upon the issuance of a § 9 type special permit from the Selectmen. If the framework of the by-law clearly call for the issuance of a § 9 type special permit to conduct a specific activity, then it also clearly does not allow said activity as of right. This interpretation of the by-law raises another problem; namely, if the by-law confers discretion on the Selectmen to grant or deny/an application for a special permit, and does not also provide standards for the Selectmen to apply in considering said applications, then that provision would confer too much discretion on the Selectmen and be invalid. See MacGibbon v. Board of Appeals of Duxbury, 356 Mass. 635 , 637-38 (1970) (delegation of authority to act upon applications for special permit for exceptions to the zoning by law cannot leave that decision subject to the "untrammeled discretion" or "unbridled fiat" of the board; adequate standards must be provided). Zoning regulations, however, have a strong presumption of validity. Sturges v. Chilmark, 380 Mass. 246 , 256 (1980). While Article XXV on its face does not provide the Selectmen with standards for considering applications for special permits, it may be construed to so provide. It is well settled that a zoning regulation must be read in its entirety and be given a sensible meaning within that context. Board of Selectmen of Hatfield v. Garvey, 362 Mass. 821 , 826 (1973); Murray v. Board of Appeals of Barnstable, 22 Mass. App. Ct. 473 , 478 (1986). Moreover, Zoning regulations should be interpreted so as to render them a consistent and harmonious whole, so far as reasonably practicable. See LaMontagne v. Kenney, 288 Mass. 363 (1934). The Court, having conducted a de novo review of the case and making its own findings of fact, must now determine whether the decision of the Selectmen was arbitrary, capricious, unreasonable or whimsical. [Note 4] MacGibbon v. Board of Appeals of Duxbury, 356 Mass. 635 , 639 (1970). The denial of a special permit is within the discretion of the permit granting authority. Id. at 638. A board may deny an application, even when they could have legally granted it. Zaltman v. Board of Appeals of Stoneham, 357 Mass. 482 , 484 (1970). The court, in reviewing the board's decision, does not have the same discretion as the board. Subaru of New England v. Board of Appeals of Canton, 8 Mass. App. Ct. 483 , 486 (1979). Rather, the court must simply determine whether on the facts found by it, the board's decision was arbitrary, capricious, unreasonable or whimsical. It is clear from the facts I have found that Route 53, the proposed location of the Speedee facility, is already very congested. The Speedee facility will have some impact on traffic, and if any of the other proposed projects became operational, then Route 53 couid potentially be in demand over its capacity at peak periods. See Cayon v. Chicopee 360 Mass. 604 , 606 (1971) (future developments in an area are a proper consideration for a permit granting authority in determining whether to grant a special permit). The Town has recognized this problem and implemented a building moratorium in the B-1 business district. Two criteria listed in § 120-125 for the Selectmen to apply in their consideration of special permit applications are whether there will be any nuisance or serious hazards to vehicles and whether the public convenience and welfare will be substantially served by the proposed projects. In applying those criteria to the facts I have found, I rule that the Selectmen did not exceed their authority in denying the Colantuones' application. The decision of the Selectmen denying the Colantuones' application is therefore affirmed. [Note 1] Section 120-24 (A) is the provision which regulates service stations, repair garages, and car washes in the B-1 business district. See App. B. The parties do not agree on whether the Speedee facility would be a service station or a repair garage. The definitional section of the by-law, § 120-6, defines the term service station, but not the terms repair garage or car wash. See App. A. Section 120-6 does, however, define the term public garage; and the Colantuones argue that the term repair garage in § 120-24 (A) actually is referring to the term public garage. In examining the activities which would be involved with the Speedee facility, I rule that it is a use which shares certain attributes associated with both service stations and repair garages. In ruling that the Colantuones' application is governed by § 120- 24 (A) , I give great weight to the fact that the Selectmen apparently considered the Colantuones' application under the provisions of that section. In ruling that § 120-24 (A) applies, it is not also necessary to classify the Speedee facility as either a service station or a repair garage because the parties agree that it is one or the other, and classifying the Speedee facility as one or the other would in no way affect this decision. [Note 2] Section 120-124 of Article XXV does provide a list of conditions which may be imposed on the grant of a special permit, and this section does apply to all special permit granting authorities. These types of conditions, however, are not the same thing as standards which a permit granting authority must apply in considering whether an application for a special permit should be granted. application to operate a service station, repair garage or auto washing facility. Section 120-101 is contained in the article which provides various supplementary regulations and, is entitled "Service stations and car washes". The contents of that section refer variously to gasoline service stations, filling stations, service stations, auto washing stations, and car washes. The Colantuones argue that because § 120-101 does not mention repair garages, that it does not apply to them. I decline to rule on this issue because, as I shall develop subsequently, the decision of the Selectmen can be affirmed without reaching this issue. [Note 4] The Colantuones have also argued that the decision of the Selectmen was defective because it failed to clearly set forth the reasons for the Selectmen's decision. This assertion is misplaced. A special permit granting authority is not required to set forth detailed findings in their decision when they deny an application for a special permit. MacGibbon v. Board of Appeals of Duxbury, 369 Mass. 512 , 515 (1976). In examining the decision of the Selectmen, I rule their decision sets forth adequate reasons for their decision, and is therefore not defective on that basis.